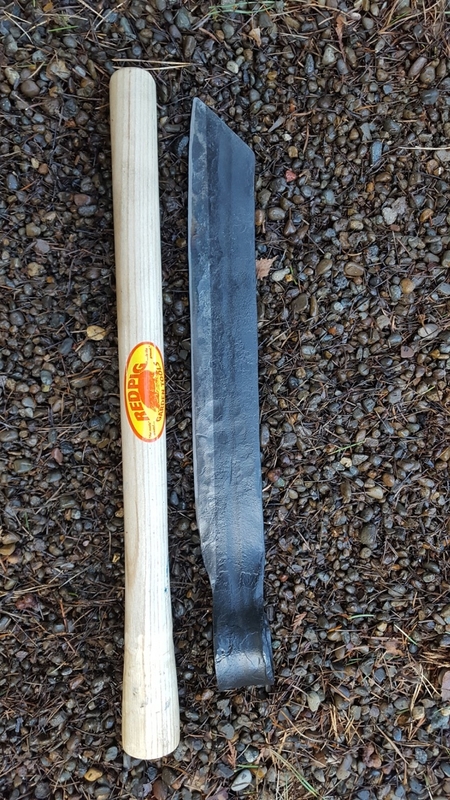 Here's a tool designed specifically to grub out the Northwest's most noxious weed--the Himalayen Blackberry. And it makes short work of ivy too. When Bob and Rita bought their acreage in Boring, Oregon, it came with a generous endowment of Himalayan blackberry, an invader that is to the Northwest what the Kudzu is to the Southeast. Bob spent days grubbing out blackberry thicket, canes, root runs and seedlings. After removing 20-foot-long, one-inch-thick canes from a holly tree he decided that if you're really bad and end up in Hell for eternity, that's probably what the devil makes you do. He used various tools for grubbing out both blackberry and a foot-thick mat of English ivy from the property. 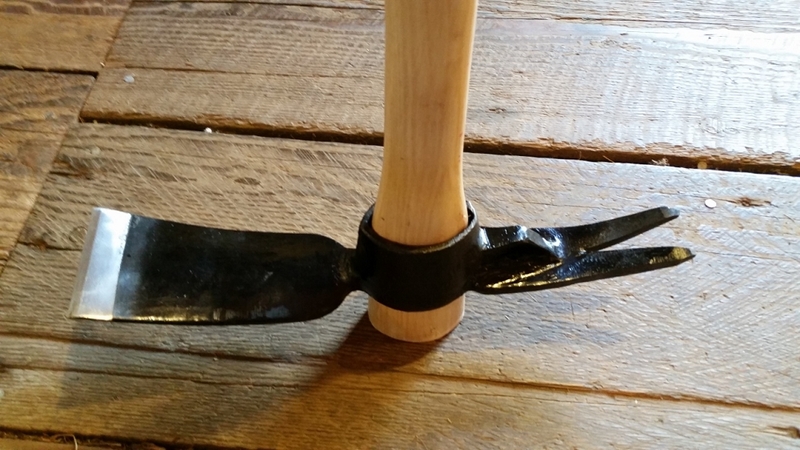 The lack of a single tool suited to the task led Bob to invent our Blackberry Hoe. The tool combines a four inch wide mattock blade for excavating and cutting roots with a large, V-notched claw. 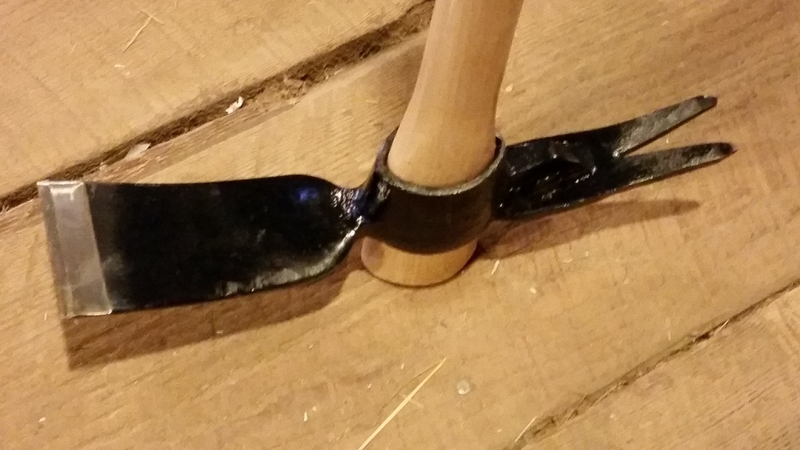 The blade is used to dig out the main crown and to follow the spreading roots which sink new taproots every few feet. The claw is used to uproot each of the outlying taproots as they are encountered. 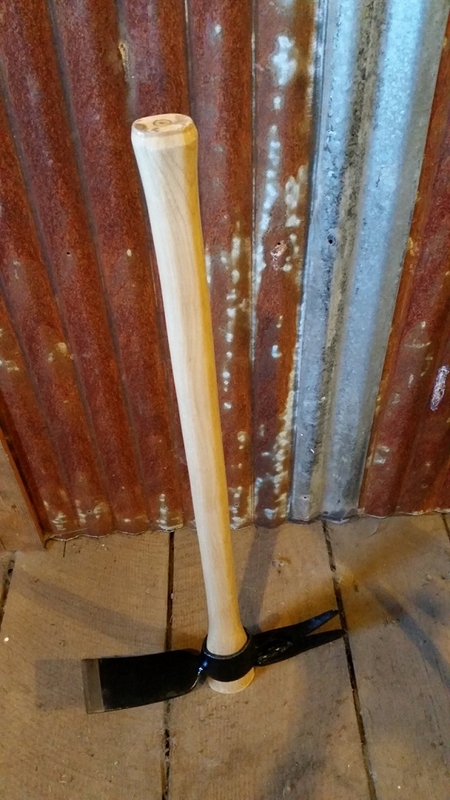 The Blackberry hoe is equipped with a 36-inch long hickory railroad pick handle so you have plenty of levering power. The hoe head is made of 3/8-inch thick steel. It's a brute of a tool. To extract small blackberry seedlings you swing the tool to drive the mattock blade full depth just to the far side of the seedling. A bit of levering and a hearty tug pulls out a slab of soil including the seedling. For grubbing thickly matted ivy I find the best technique is to use a sharp spade or edging tool to cut the ivy patch into a grid of 2-foot squares. Drive the blade through the roots deep into the soil. Then, starting with the outermost sections of the grid, use the Blackberry Hoe's blade to chop away the mat of vines flush with the ground. Then use the claw to pry up underground roots. You can use the Blackberry's Hoe's blade for making the initial grid cuts but a spade can be driven deeper and makes a neater job of it. You'll find lots of other uses for a Blackberry Hoe. If you're plagued by industrial size dandelions, burdock and thistle, the tool does an excellent job of rogueing them out. As with all bladed tools, sharpen often. Don't wait until the blade is dead dull to file the edge. Instead, work like a butcher, honing frequently to maintain a keen edge.